Thanks for your purchase! The download you are about to attempt is 1.2GB. Files that are larger than 1GB cannot be reliably downloaded by Internet Explorer 6 or 7 and Windows versions lower than Windows XP, and will frequently have glitches and other troubles after download (if download completes) due to a Windows codec problem. We recommend you use Firefox, Chrome or Safari to download your digital files. In 1978, a mechanical engineer who had developed new skateboard products teamed up with one of the most popular skaters of the era. 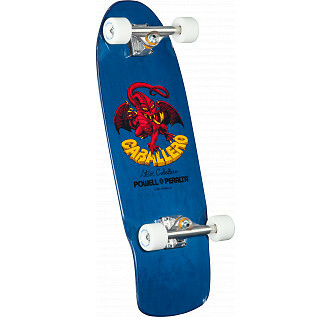 George Powell and Stacy Peralta created Powell Peralta and immediately began retooling how skateboard products were made and marketed. George, who had started developing products in his garage and kitchen oven, went on to invent innovative equipment such as double radial Bones wheels, named for their unique whiteness, and trend setting skateboard decks. Stacy recruited the skaters and handled marketing along with his longtime creative cohort Craig Stecyk III. Rejecting the expected action shot marketing, they used their young team to create esoteric images conveying the culture's sarcasm and disenfranchised dark humor. While spitballing about his stable of skaters, Stacy commented that he never wanted to call them a "team," a label that invited all kinds of jock baggage. Craig shrugged and simply said, "Bones Brigade." 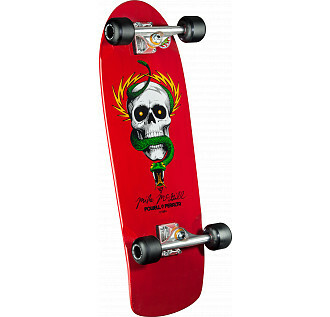 Powell Peralta reinterpreted a military motif, warping it with pioneering skateboard graphics more suited to biker gang tats than decks. As great a skater as Stacy was, his scouting skills surpassed any celebrated onboard skills. 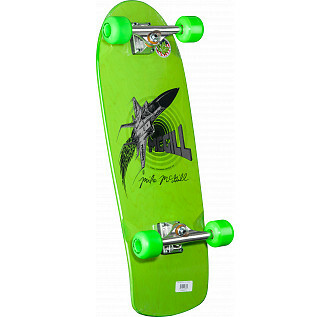 By 1984, Tony Hawk, Rodney Mullen, Steve Caballero, Lance Mountain, Tommy Guerrero and Mike McGill compiled the most competitively dominant skateboard team in history. On top of winning large, cheap plastic trophies, Tony Hawk and Rodney Mullen—two 13-year-olds initially ridiculed by their peers—created new ways to skate and pioneered modern technical skating. Disgruntled at the way the skate mags played favorites, Stacy weaponized consumer VCRs by directing The Bones Brigade Video Show in 1983. The low-budget amateur skateboard video was the first of its kind and sold a surprising 30,000 copies (including Betamax!). At the time, skating needed all the help it could get. The 1970s "fad" that swept the country after the invention of the urethane wheel had deflated embarrassingly by 1981. Remaining participants' social status ranked below the chess club. 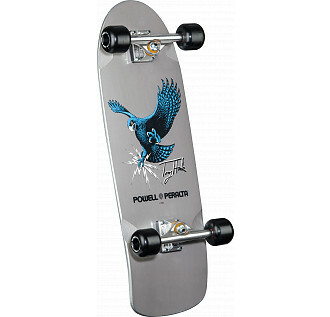 Powell Peralta averaged an anemic 500 monthly board sales and Tony Hawk once received a royalty check for 85¢. To increase brand awareness and grow skateboarding, Stacy produced and created a new Bones Brigade video every year, showcasing his crew's varied personalities and invented maneuvers. The videos routinely featured riders crawling out of sewers, skating abandoned pools and back alleys, bombing desolate hills—essentially shredded an apocalyptic world hidden to most non-skaters. Film not available in AUS/NZ. Click here for more details. 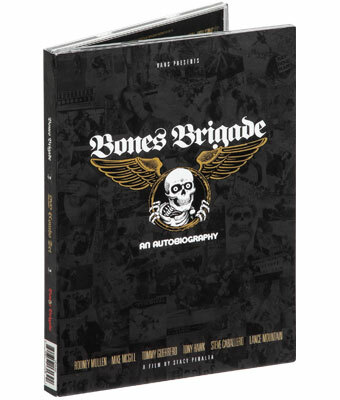 Contains the 2012 release, Bones Brigade : An Autobiography and the 2013 release, Bonus Brigade. The original shape and graphic from the 1980's. Screened top and bottom graphics, applied with heat and pressure. Seven plies of US hard rock maple- Only the best of the best that is available. Wheel wells when called for. Made in our US factory. Produced to celebrate the release of Stacy Peralta's new film "Bones Brigade: An Autobiography". Perfect for riding, gift-giving, collecting and displaying. Wheel color can change from Black, Blue or White. Wheel color can vary from Green, Black, or White. 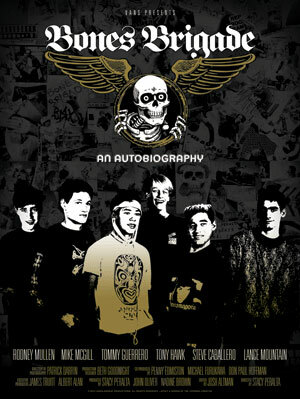 Produced to celebrate the release of Stacy Peralta's film "Bones Brigade: An Autobiography". Perfect for riding, gift-giving, collecting and displaying. 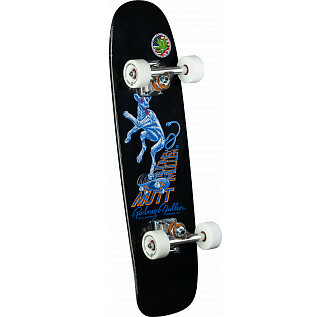 Comes with Bones Brigade Cab Blem Deck Blue, Independent 169 Trucks, White Rat Bones 60mm wheels, Bones REDS bearings, and ML Grip tape, hardware and risers. 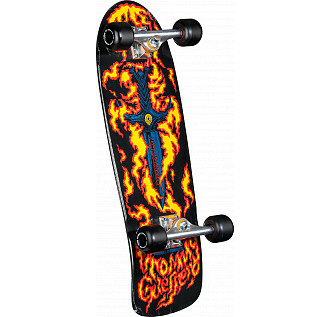 Complete Includes: BB McGill Blem Deck, Indy 169 Trucks, Bones REDS Bearings, Mini Logo Grip, Hardware and risers, and PP Mini Cubic Wheels Black. The original shape and graphic from the 80's. Complete Includes: BB Blem Deck, Indy 109 Trucks, Bones REDS Bearings, Mini Logo Grip, Hardware and risers, and Rollerbones 57mm 98a wheels. Original shape and graphic from the 1980's. 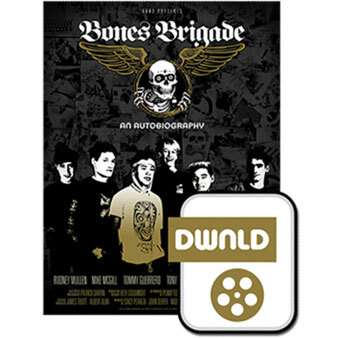 Produced to celebrate the release of Stacy Peralta's film "Bones Brigade: An Autobiography". Perfect for riding, gift-giving, collecting and displaying. Up to 1,000 of this colorway may be offered. There are no current screenings scheduled. Please check back soon for updates or view the screenings history.